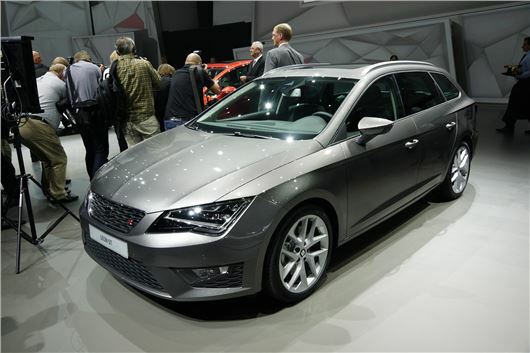 SEAT has taken the wraps off the Leon ST - it's the first time it has ever produced an estate version of the model. The ST will go on sale in January 2014, priced from £16,999. It becomes the third member of the SEAT Leon family, following the five-door hatchback and three-door SC, which have both hit showrooms in the past 12 months. The new Leon ST estate promises plenty of load space and to major on flexibility. The boot is 587 litres with the seats up and this can be increased to 1,470 litres with the seats folded. The twin-level boot floor makes loading bulky items much easier; the rear seats can be folded flat using easy-to-reach handles on the sidewalls of the boot. It measures 4,535 mm long (264 mm longer than the five-door Leon) and is said to have useful touches to make it easy to live. The rear seat backrests, for instance, can be folded very easily from the boot using integrated release handles. Engines include a wide selection of petrol TSI and diesel TDI units. It kicks off with the 1.2 TSI 105 PS, which develops 105 PS and, on paper at least, returns 57.6 mpg and 114 g/km CO2. Other options are the 53.3 mpg 1.4-litre TSI and 1.8 TSI engine (47.9 mpg) that will be used for sportier models. All three petrol engines are available with a DSG twin-clutch automatic gearbox. Diesels are the 105PS 1.6-litre TDI 105 PS, (74.3mpg/99g/km) and 150PS 2.0-litre TDI (68.0mpg/112g/km CO2). Interestingly, SEAT has also unveiled a new Ecomotive version of the 1.6-litre TDI that comes in at 87g/km and 85.6mpg combined. It's also quicker than the standard 1.6-litre, getting to 62mph in 10.4 seconds, while the 105 PS 1.6 TDI version does it in 11.1 seconds.